1. Lemurs are only found on the island of Madagascar, located about 250 miles off the coast of Africa, and the Comoro Islands, a volcanic archipelago just to the northwest. 2. Lemurs rafted to Madagascar on floating islands of vegetation over 40 million years ago, where they flourished in isolation without much competition or major predators. 3. Lemurs the size of gorillas once roamed the island, though many of these larger, slower species of lemur have become extinct, likely due to hunting. Today, subsistence hunting still poses a threat to lemurs. 4. There are over 100 extant lemur species and five families of living lemurs. Species in each family include ruffed, ring-tailed and bamboo lemurs (Lemuridae), aye-ayes (Daubentoniidae), sportive lemurs (Lepilemuridae), indri, sifakas and woolly lemurs (Indriidae), and mouse and dwarf lemurs (Cheirogaleidae). 5. A new species of primate, the golden bamboo lemur, was discovered by Dr. Patricia Wright, a primatologist and anthropologist who helped establish Ranomafana National Park in Madagascar. 6. The Latin word lemures referenced the wandering spirits of the dead in Roman mythology. During the Lemuria Festival in Ancient Rome, these restless, malevolent shades were placated by the head of the household, who rose at midnight to give an offering of black beans for the lemures to feast on. The lemures were then frightened into flight by the banging of bronze pots. Similarly, the Malagasy have legends that lemurs are the souls of their ancestors due to many lemur species’ nocturnal behaviors, vocal cries and reflective eyes. 7. Blue-eyed black lemurs are one of only two mammals besides humans to have blue eyes, the other being the blue-eyed spotted cuscus in West Papua in Indonesia. Both species are critically endangered. 8. Lemurs display diverse behaviors between species. Their diet may be frugivorous, insectivorous, gummivorous (subsisting off the gum and sap of trees), or vegetarian. They may be arboreal or terrestrial and inhabit tropical rainforests or deserts. Lemurs live in troops, in pairs or as solitary individuals. 9. Ruffed lemurs are considered to be the world’s largest pollinators. Pollen is spread on the noses of the lemurs as they feed on the nectar and tropical fruit of different plants, including the traveler’s palm tree, which primarily depends on the black-and-white lemur to pollinate its flowers. 10. The smallest primate in the world is Madame Berthe’s mouse lemur, weighing just 1.1 ounces, while the indri and diademed sifaka are the largest living lemurs, both weighing up to 15 pounds. 11. Species such as red ruffed and ring-tailed lemurs sunbath in the morning before foraging, warming their bellies (where their fur is thinner) in an upright, meditative position. 12. Though rare among mammals, most females in lemur society display social dominance over males. 13. Ring-tailed lemurs are the most familiar and well-studied of all the lemurs. They have a vivid black-and-white striped tail and powerful scent glands. Tamarind trees, which produce fruit and leaves at alternating times of the year, are a keystone food resource and can account for up to 50 percent of their diet. 14. 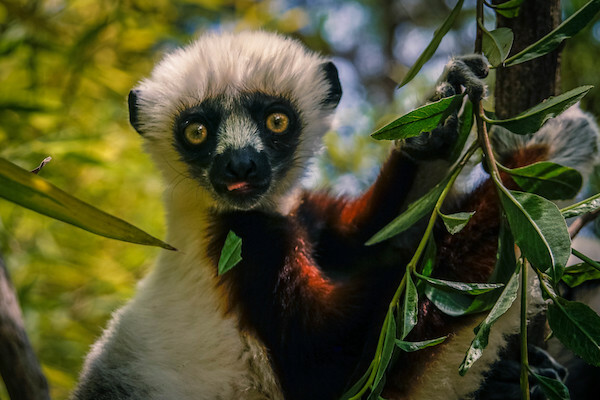 Lemurs are some of the world’s most threatened mammals, and many species are critically endangered, such as the silky sifaka lemur—called the “angel of the forest” due to its white fur. 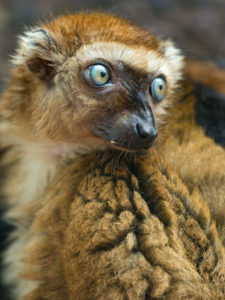 The primary threat to lemurs is habitat loss, as forests are cleared by slash and burn agriculture and illegal logging. More than 80% of lemur habitat in Madagascar has been lost since humans first arrived 2,000 years ago. 15. Malagasy conservationists and NGOs like WWF have been instrumental in many lemur conservation efforts such as the establishment of protected areas around Madagascar. 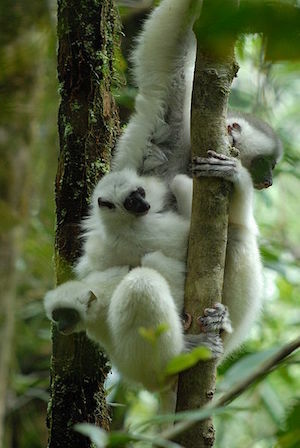 Eco-tourism is an area of interest for conservationists, as tourists provide the government and local communities with incentives to protect lemurs. 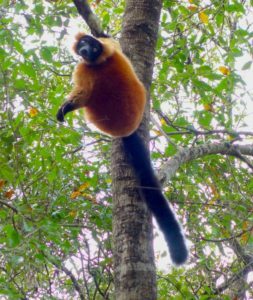 Marvel at rare lemur species in this biodiversity hotspot on Nat Hab’s Madagascar Wildlife Adventure.